Home / Leh Ride / Mototalk / Ladakh Ride: How Much Will You Spend? Ladakh Ride: How Much Will You Spend? Even though the season is almost running out as I write this post, it's never a bad idea to know a little more about something which will help you in planning, specially when it comes to a ride like this. You see information is always helpful and its better to know more if you care riding for the first time to this place. 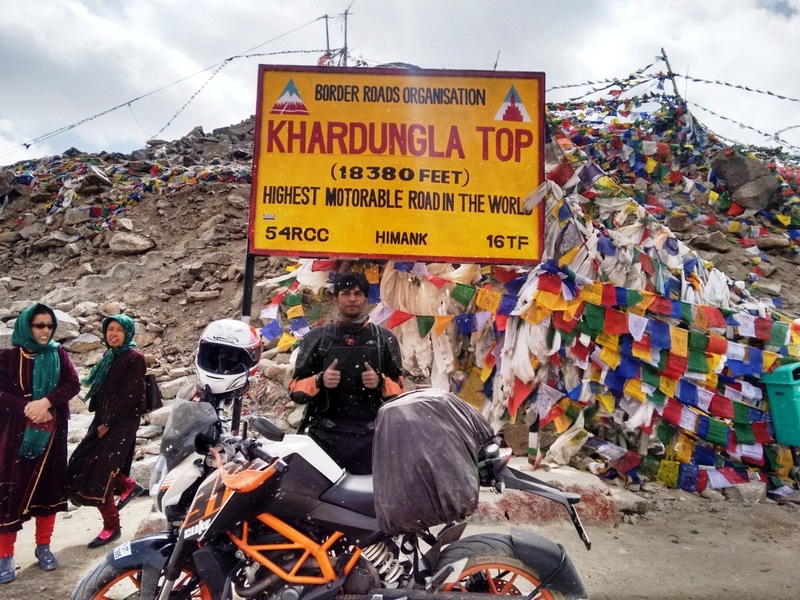 One of the common questions is about the budget of this ride and in this post I just want to help you plan on your expenses part of riding to Leh. It was a solo ride. If there are just two guys it will definitely bring down the costs in terms of accomodation and food to some extent. The will be different in case there are 3 riders (on 3 bikes) and so on. The ride happened in the month of September. 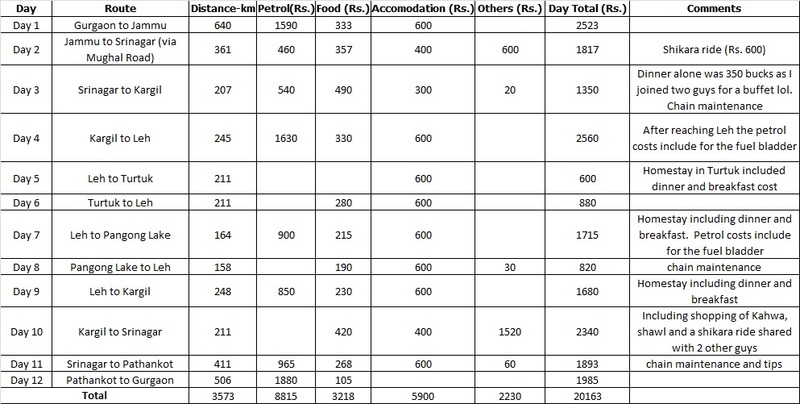 At this time most of the traffic to Leh has reduced and this means the hotels/accomodation becomes cheaper and you can bargain more too. Another point on choice of accomoddation- I am a budget traveller and I completely avoid luxury during my rides. Accomodations I chose were as cheap as Rs. 300 for a night sometimes. The bike was Duke 390. This will definitely affect your fuel cost (at the same time I faced zero issues with the bike so the repair costs were close to zero too). The ride started and ended in Gurgaon. With these basic factors set, let's move to the main part here on how much you will spend on this ride. As you will notice, approx. Rs.2000 in Others is only optional. And as I said that if there are two guys riding the accomodation and food costs can be shared and in that case it will come down almost by 50% of the total food and accomodation costs. However its important to note that these are only the costs during the ride. There are several aspects which you can't ignore when it comes to spending before the ride, Mainly this will be the costs of medical stuff, spares and riding gear if you do not have any. Approximately you will end up spending Rs. 500-600 on medical stuff, around Rs. 1000-1500 on minimal spares to carry, which obviously depends on the bike you are riding. Then there is the cost for motorcycle luggage which will be anywhere between Rs. 3000-5000. So for the overall budget planning you need to add these costs too. Now this will give you a good comparison for the costs which numerous tour operators will charge you in the range of Rs. 25000-Rs. 35000 which will not even cover petrol etc. Hope this post helps and if there are any queries do comment below! Can you also do separate posts on best riding gears, as well as the luggage and spares to carry for such a trip? I have posted reviews of the tankbag, and the fuel bladder here which you can check in the reviews section on this blog. I will also post the review of Viaterra Fly which I carried on the ride. I like watching and reading about the people who reach some pics. You have described in great detail all the expenses for the trip. It is very to help me plan the budget for our trip. Your article will be very helpful to plan expenditure for the upcoming trip. This is a very valuable full information. You see money is needed everywhere and it is so good if you have it enough to spend on your needs.